The original Skagen Falster is one of the most beautiful smartwatches we've laid our eyes on. Unfortunately, it didn't have a lot of features to complement that beauty. It was a standard smartwatch experience. The Skagen Falster 2 is changing that with the next generation Wear smartwatch getting a heart rate monitor, GPS, NFC and waterproofing along with swim tracking. That's pretty much a full suite of hardware features. Well, except for LTE. The heart rate sensor will work nicely with the new version of Google Fit, and Skagen said it was the most requested feature from fans. Skagen has also gone ahead and updated its minimalist watch face for HR monitor addition, adding a tiny complication on the left that lets you see your heart rate. GPS will let you track your outdoor runs and biking sessions without your phone and NFC will bring contactless payments via Google Pay. Seeing as Google Pay isn't just for payments anymore, you'll also be able to use it to access public transit in select cities. Finally, that 40mm stainless steel case is now waterproof, which means you can use it while swimming to track your strokes. As for the physical parts of the case, it's largely kept to the same minimalist design as the original with some minor tweaks. The bezel is now much less than it was on the previous model. Skagen also says it's made some updates to the main dial button while adding two programmable push buttons, similar to the Fossil Q Explorist. As for the nitty gritty, we know that the Falster 2 is running the Qualcomm Snapdragon 2100, though we don't yet know what kind of AMOLED display its running or how much storage is inside. 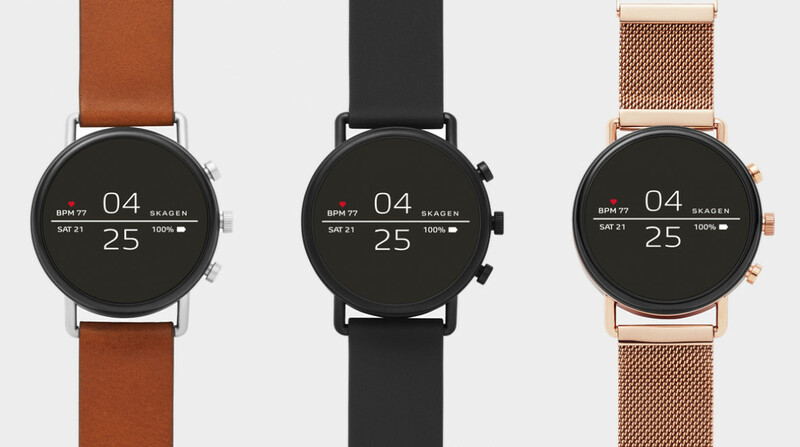 The Skagen Falster 2 will come in matte black, silver, rose gold, matte silver and matte gray. The matte black comes with a silicone strap, the silver and rose gold, and matte silver come with magnetic metal mesh straps and the matte silver comes with a cognac leather strap. It starts at $275 for the matte black model moving up to $295 for the more luxurious models.